Pennsylvania Prisons Locked Down After Staff Exposed To Suspected Tainted Drugs The case follows similar incidents in Ohio and Arkansas in which prison staff and inmates have been sickened or died, possibly from the opioid fentanyl or the synthetic marijuana K2. Pennsylvania on Wednesday ordered its 21 correctional facilities on lockdown amid a rash of drug-related illnesses among prison staff. Pennsylvania ordered a lockdown Wednesday of its entire state prison system after a number of staffers became ill from suspected exposure to tainted synthetic drugs, an incident that comes as five inmates have died from overdoses in Arkansas and dozens were sickened in Ohio under similar circumstances. State Corrections Secretary John Wetzel said the cautionary move was aimed at ensuring the "safety and security of our employees" after multiple illnesses among prison staff in recent weeks. "Our state prisons, especially those in the western part of the state, have experienced recent incidents in which employees have been sickened and we need to get to the bottom of this issue now," Wetzel said. The state's 21 prisons will remain closed to visitors indefinitely, and most mail service throughout the system has been frozen, according to The Associated Press. 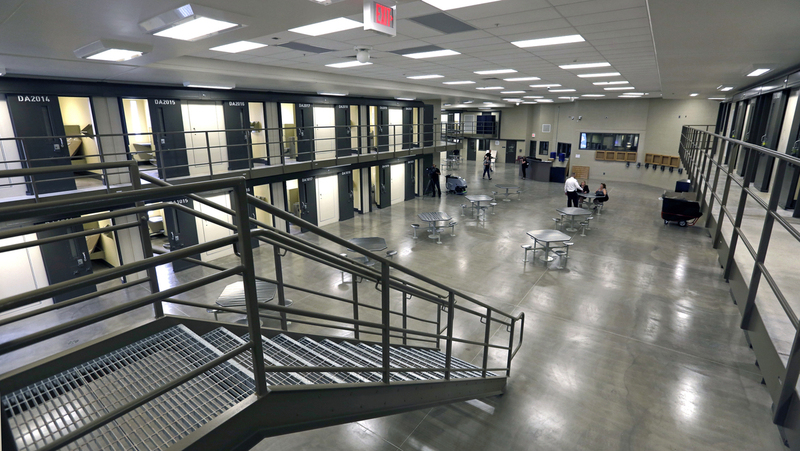 Since Aug. 6, 29 employees have become sick in 13 separate incidents throughout the Pennsylvania prison system, and that's not counting inmates who have also become ill.
"This weekend was kind of rough. The last couple of days we even had a couple more incidents. So, the secretary said, 'That's it, lock it down,' " Corrections spokeswoman McNaughton tells NPR. That means no inmates will be moved, she said. "They're not going to leave their housing unit to go to programs. They're not going to leave their housing unit to go to education or to eat their meals. Everything is going to happen in their cells," McNaughton says. So far, only synthetic cannabinoid — known as K2 or spice — has been connected to the string of illnesses in Pennsylvania, McNaughton said. The order to close off Pennsylvania's prisons to the outside world came hours after Ohio reported that more than two dozen people were treated for possible exposure to what officials there believe is the powerful opioid fentanyl. Also on Wednesday, in Arkansas, two inmates in a maximum-security prison were found dead, bringing the number of suspected drug-related deaths at the facility this week there to five, according to the state's Department of Correction. Arkansas officials have not confirmed the cause of death for the five inmates at the Varner Unit this week, but Reuters, citing the Department of Correction, reports that tainted illicit drugs are suspected. Reuters notes, "Arkansas prisons have struggled for months to halt the use of synthetic forms of marijuana, which have been linked to numerous deaths." "In 2017, there were 18 drug-related deaths, and out of those, 13 were due to K2 and one was due to a combination of K2 and another illicit drug. So far in 2018, there have been eight deaths, not including the five from this week, and six were due to K2." In Ohio, the state's Highway Patrol said 28 people at the Ross Correctional Institution in Chillicothe were rushed from the prison to a nearby hospital for treatment, including 23 correctional officers, four nurses and one inmate. A second inmate was treated at the facility. The incident began at about 9:10 a.m., according to a news release, when prison officials reported that an inmate had a possible overdose. He was treated with naloxone — an overdose reversal drug for opioids — and taken to Adena Regional Medical Center. Police then responded to calls from RCI about widespread exposure to an unknown substance, which, Lt. Robert Sellers told the AP, was thought to be fentanyl. Officials at the facility administered naloxone to those displaying signs of overdose. "All RCI staff are stable and some have already been discharged from the hospital," the Highway Patrol said in the statement. As of Wednesday evening, there have been no additional reports of exposure. "Really, what you're dealing with is something that with minimal contact, you reach and touch a surface, then reach and scratch your eye, you absorb that stuff, and its potency is enormous," the hospital's chief clinical officer, Kirk Tucker, said at a news conference. "The sickest folks that were exposed by the substance came in unconscious and not breathing, so they couldn't control their airway," Tucker said. According to the State Highway Patrol, an entire cellblock housing 31 inmates was contaminated. The men have all been relocated "to other secure areas of the facility." Samples of the unknown substance have been collected.